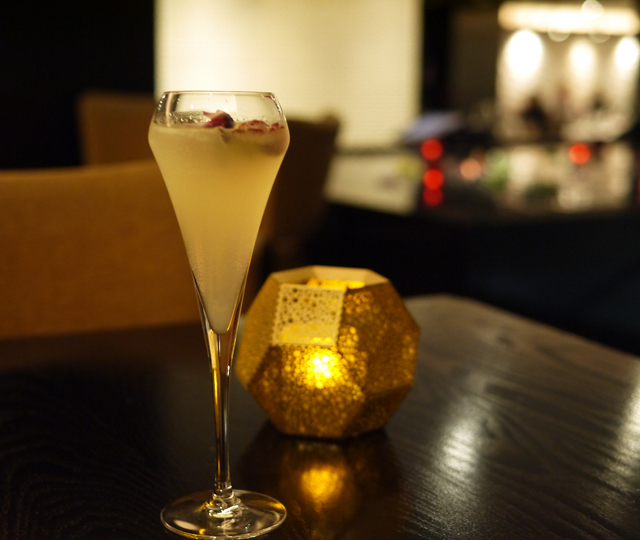 My guilty secret – when I was first asked to get involved with Curry for Change, the restaurant that I really wanted to visit was Benares. I have been before, several years ago and loved it then. 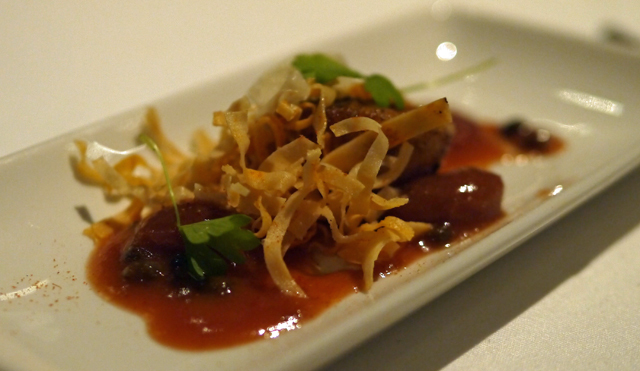 Now, with a slightly better understanding of Indian fine dining, I really wanted to return and try some of the dishes. And, since Atul Kochhar is one of the longest standing supporters of Curry for Change, it seemed like the perfect opportunity. If you chose to go during June you’ll be invited to leave a donation to Curry for Change. In the main dining room we started to look through the menu. As my companion and I are not Indian food specialists, we decided to ask for recommendations. And, once again, absolutely no regrets, we were rewarded with a wonderful selection of dishes. 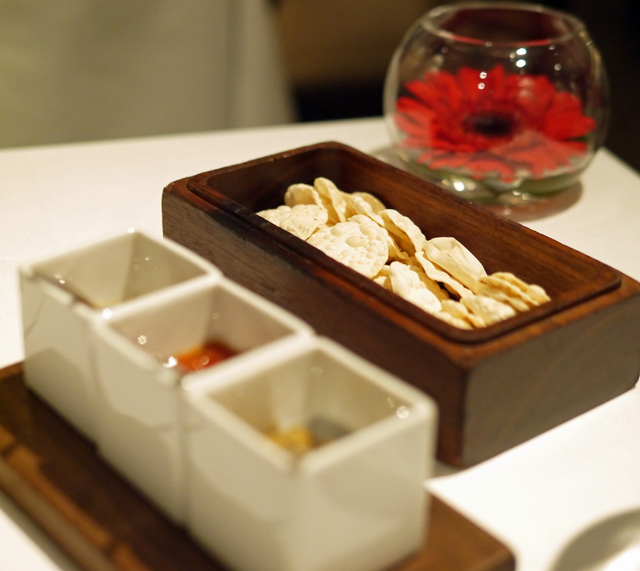 Of course there were Poppadums to start, with three home made, very fresh chutneys. I’m still getting used to the idea that chutney isn’t necessarily a gloupy sweet mixture from a jar, here the chutneys are made daily and are extremely light. Our selection of pineapple, tomato and gooseberry had no clear leader although if pushed I’d probably have eaten more of the gooseberry. Our starters were a trio of dishes. Jal Tarang, pan roasted scallops was served with ginger and grape dressing and spring roll pastry crisp. A richer sauce than I’d normally expect with scallops the crispy spring roll topping worked well to offset the reduction of grape and ginger. And, needless to say, the scallops were perfectly cooked. Gilafi Seekh Kebab, a tandoor cooked minced lamb kebab came with a side sauce of onion mint chilli and coriander. It was hot! Not mind blowingly so but enough to give a real kick so I commented. And, the chef appeared, apologetically, from the kitchen. Actually I liked it and was impressed that it hadn’t been watered down for our Western palate in this very refined Indian restaurant. I’d rather have a little heat, especially when it is served on the side so that you can adjust everything to your own taste. 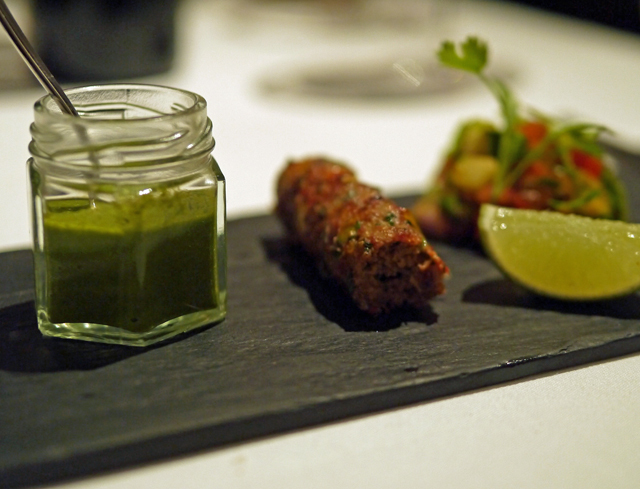 Much the most beautiful of our starters was Chukander Kofta. Now ‘Beetroot dumplings’ really don’t sound that wonderful do they? 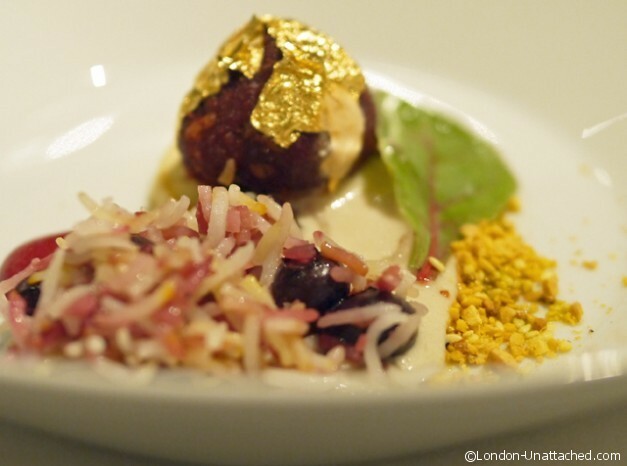 But here’s what the dish looked like, a neat beetroot dumpling topped with gold foil. And of course when you cut into the dumpling it was that perfect, deep red beetroot colour. All in a really delicious dish that had me wondering if I could just turn vegetarian. 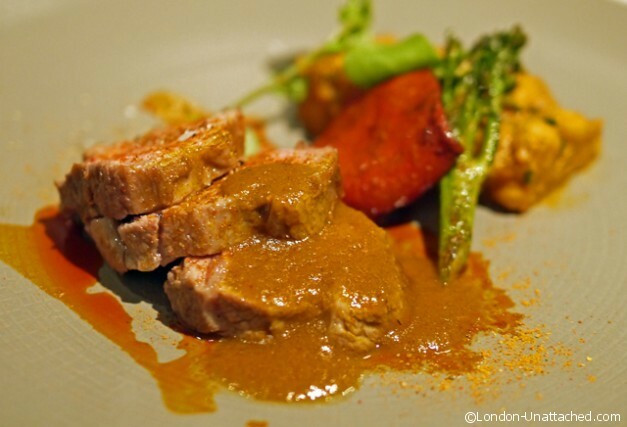 Mind you, any ideas of a vegetarian lifestyle were quickly abandoned when we moved on to our main course of Mongsho Ghugni – roasted lamb rump seasoned with salt and garam masala, spiced chickpeas, roasted broccoli and Spanish peppers served with rogan sauce on the side. We shared a portion of dhal to go with it, which arrived picture perfect in a minature pan. Now, this type of Indian food is light and delicately spiced; everything is presented beautifully and the ingredients are top quality. The pan seared lamb, finished in the oven would have done any kitchen proud and the meal as a whole as far removed from the average Indian takeaway as a burger from Bar Boulud is to one from MacDonalds. 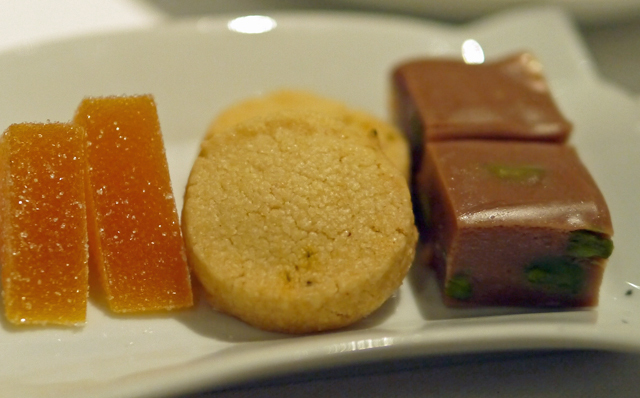 Benares has a good range of unusual desserts too. I loved the the rose and raspberry Bhapa Doi (rose flavoured steamed yoghurt) which was light and delicate but still perfectly creamy. 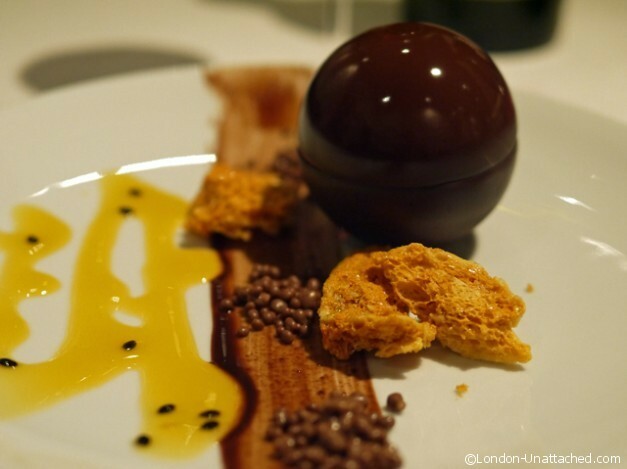 While I didn’t actually order or eat the dark chocolate mousse, the drama of this dish, where hot chocolate sauce is used to melt the chocolate bomb seemed perfectly fitting. 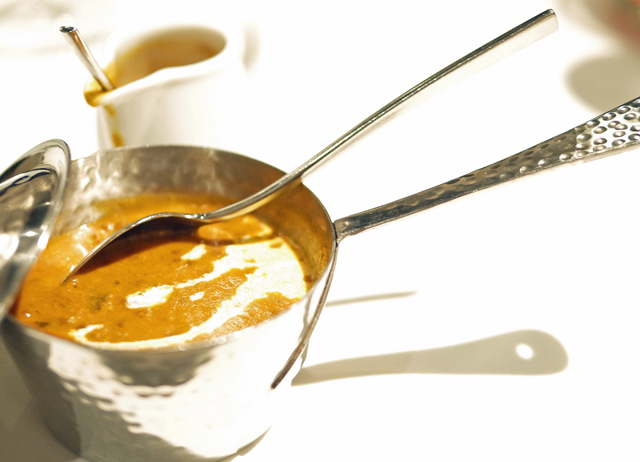 During June there are a number of top restaurants participating in Curry for Change. 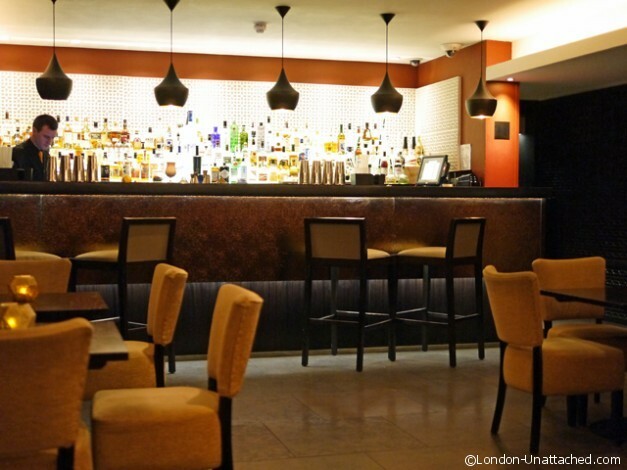 You can find out more on London-Unattached. 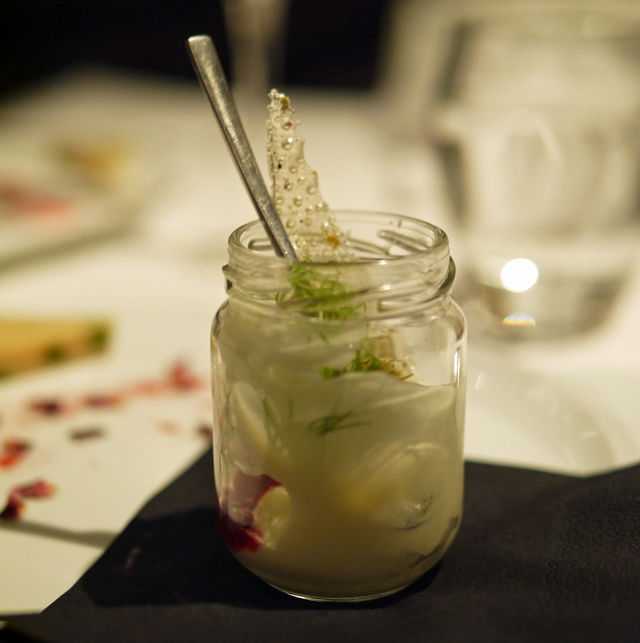 There’s also a rather special opportunity in October to win a unique cookery experience at Benares with Curry for Change. Last year I visited Benares for the first time and as well as reviewing the food I did three recipe shoots there. The food is simply divine, the kitchen clean and the staff friendly. Lovely place, lovely food and the meal you had looks fit for a king! What an awesome place to really dig into Indian food. It sounds — and looks- amazing! Lovely to read. I somehow always think of Indian cooking as the take away option rather than fine dining. Your article puts paid to such notions. I must put Benares on the list. Indian food in London is so much more than that now. And yes, you should definitely visit! I LOVE this review and FOOD and I am also keen on the Curry for Change campaign too Fiona! There’s a second part to Curry for Change where we are all invited to cook a curry. Hope you’ll be taking part Karen! Oh Fiona! What a feast, I love the look of ALL of it and am drooling into my keyboard!